"Half length portrait of a young man," Gabriel Bray, 1774, National Maritime Museum. 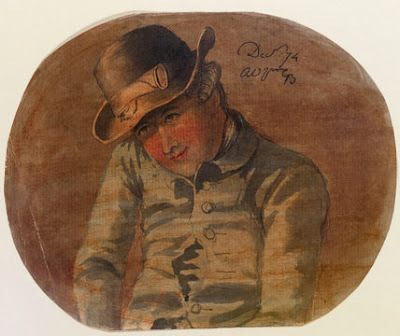 This intimate portrait was done by Bray aboard the frigate Pallas during her 1774-1775 cruise. 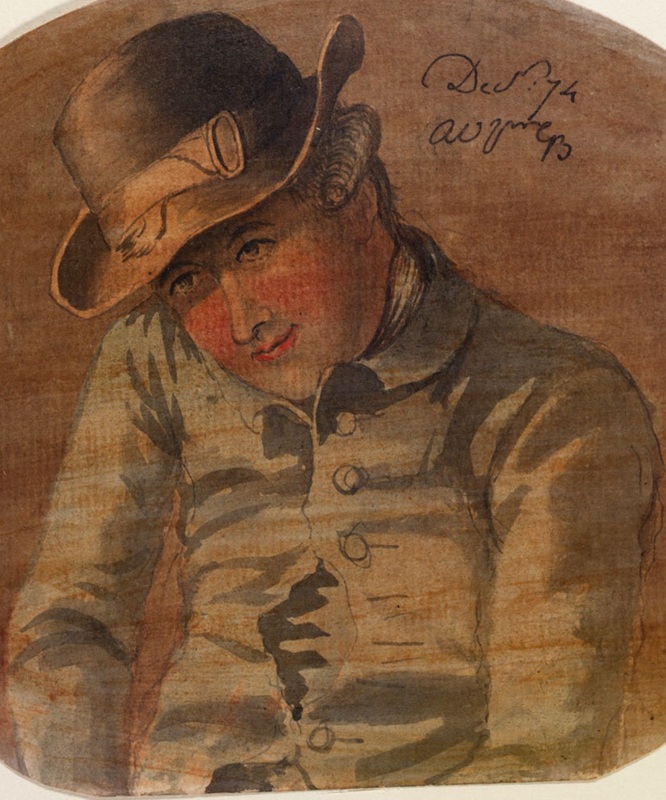 Though the sitter is unidentified, the National Maritime Museum speculates that it may have been an officer or a mate. The clothing is simple, the same as a common seaman would wear. There are examples of officers wearing simple sailor's clothes, like in "Etched from the Life on Board a Scotch Ship: Cook, Captain, and Mait" or the portrait of Captain Andrew Wilkinson. It wouldn't be unheard of for a naval officer to wear more common clothing. There is also the possibility that this is a master, or another warrant officer who was not subject to uniform regulations. Regardless of this man's place in the Pallas' hierarchy, he wears a round hat with a broad band around the crown fitted with an oval buckle. Its brim is turned up on each side at something of a jaunty angle. His hair is turned into side curls, and it appears that the hair at the back of his head is cut short. With his head bent forward, the sailor hides us from a good view of his cravat, which is tucked behind his jacket. We do get a hint of it beside his neck, where the white fabric peaks out. His light blue jacket is single breasted and fitted with large cloth covered buttons, a pair of which are missing from the middle. This gives us a view of his waistcoat or shirt beneath. Though there is little detail it appears to be of the same fabric as the jacket.